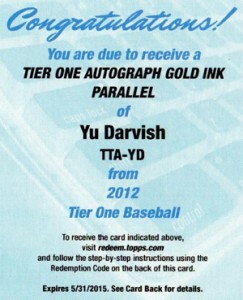 Home » Baseball » What Are the Top Selling 2012 Topps Tier One Baseball Cards? 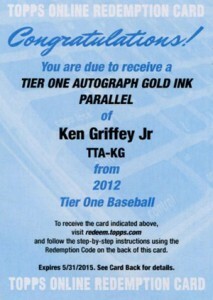 What Are the Top Selling 2012 Topps Tier One Baseball Cards? A lot of products are filled with big hits and equal misses. While many have quashed 2012 Topps Tier One Baseball for including autographs of Gabby Sanchez and Marlon Byrd in a $100 per pack product, there's no ignoring the other end of the spectrum. During its first week on the market, six 2012 Topps Tier One Baseball cards broke the $1,000 barrier on eBay alone. The top sale was a familiar name this season: Yu Darvish. A one-of-one redemption for a Gold Ink Autograph parallel went for a staggering $5,000. 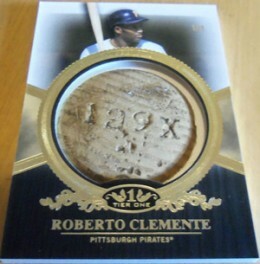 Next up was a one-of-one Bat Knob of Roberto Clemente, which sold for $3,049. 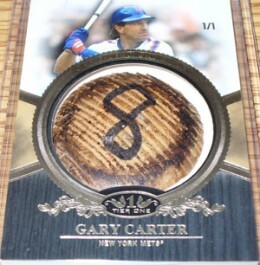 The 2012 Topps Tier One Baseball Bat Knob cards have gotten tons of hobby attention and seen very strong bids. 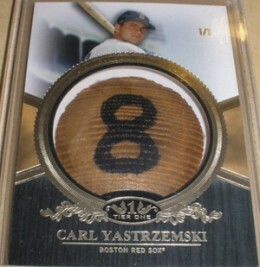 Bat Knob cards of Carl Yastrzemski and Gary Carter were also among the top early sales. In the few days, several more massive sales are expected as Mickey Mantle, Ty Cobb and Joe DiMaggio are among the Bat Knobs currently listed on eBay. 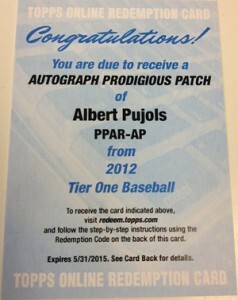 Other than the unique bat pieces, autographs have ruled initial 2012 Topps Tier One Baseball sales. A one-of-one Ken Griffey Jr. Gold Ink Autograph redemption sold for $1,755. 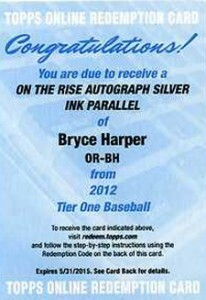 A pair of Bryce Harper On the Rise Silver Autographs (#/10) closed at $1,500 and $800. 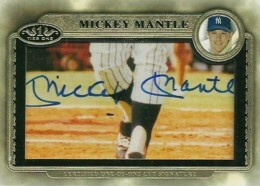 Vintage collectors may be happy to know that Mickey Mantle is on the one-of-one Cut Signatures checklist. In fact, he's the only name on the list. Oddly, he has 25 different cards, all of which look very similar save for a small photo in the top corner of the card and the checklist numbering on the back. Even the cut signature source, a color photo, shows uniformity in placement and signature size. Nonetheless, this hasn't slowed bids, with two of the cards finishing in the top ten eBay sales. The first sold for $1,199.99 and the second for $850. Below is a complete list of the top 10 eBay sales during the first week 2012 Topps Tier One Baseball was on the market. It is worth noting that major transactions can and do take place off the site. 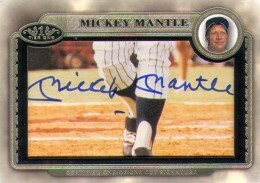 In fact, both the Mantle and DiMaggio Bat Knob cards have changed hands once already offline.